Jacki had the privilege of representing Gold Bond at the 2018 American Academy of Dermatology’s Annual Meeting in San Diego, CA. 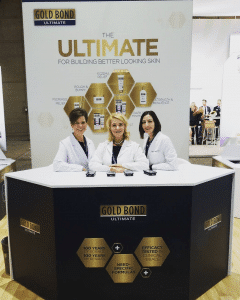 What a pleasure it was to educate a multitude of attendees on several Gold Bond Ultimate products, alongside my dermatology PA colleagues Renata Block from Chicago and Gina Mangin from Orlando. Thank you Gold Bond! ‘Old Man Winter’ Won’t Get The Best of Our Skin!